Each month we will focus on one of several genres, including Yokoyama style honkyoku and Kinkoryū honkyoku and gaikyoku, along with relevant technical aspects such as meri technique, ornamentation, and tone. Please arrive early for a 3pm start. University of Melbourne Ensemble Space, 210 Berkeley St, Parkville. If you have any questions, please email Lindsay: lindsay[at]lindsaydugan[dot]com or call 0415 305 777. Lindsay lived for ten years in Japan, studying classical honkyoku with Katsuya Yokoyama and Kaoru Kakizakai. 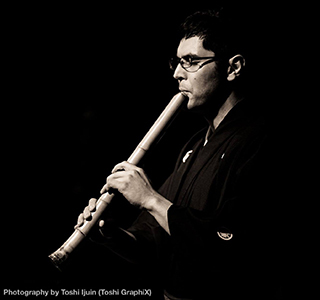 He holds Masters degrees in shakuhachi performance from Sydney Conservatorium of Music and Tokyo Geidai (Tokyo University of the Arts), and is a shihan of the Chikushinkai. This entry was posted in Workshops and events on May 3, 2017 by Lindsay.